Do you wish that sometimes, you could shut out the world and curl up into a ball? Guess what. 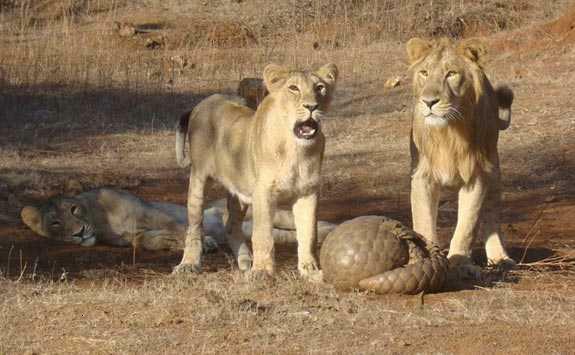 Pangolins actually do that and let their tough body armor turn away predators. Unfortunately, that’s no defense against human poachers. Pangolins are believed to be the world’s most trafficked (hunted and traded) mammal – for their meat and bony scales. In mid-January, Hong Kong authorities were alerted to a shipment that was on its way from Nigeria to Vietnam. They found pangolin scales and elephant tusks hidden under slabs of frozen meat on the cargo ship. Authorities believe 14,000 pangolins may have been killed to produce the nine tonnes of scales that were confiscated. Pangolins are known as scaly ant-eaters, thanks to their body armor of scales and their preferred diet of ants. They are found in forests and grasslands across Asia and Africa and play an important role as pest-controllers in the ecosystem. The small and shy nocturnal mammals weigh between 1.6kg (3.5lbs) to 33kg (73lbs). Curiously, males are 50% to 90% heavier than females. The claws on their feet help dig up nests and burrows of their prey, i.e. ants and termites, which they then scoop up with their incredibly long and sticky tongues. In fact, their tongues can be longer than their bodies and extend outwards from a chest cavity. Pangolin pups are carried around on their mother’s tail for 3-5 months until they can live alone. Like many other ant-eaters, pangolins have poor eyesight but have a strong sense of smell. All eight species of pangolins are either vulnerable, endangered, or critically endangered. The pangolin’s body is covered in hard overlapping scales, right from the base of its conical head all the way to its tail. These scales are made of keratin, the same protein that makes up our hair and nails. In fact, the word ‘Pangolin’ comes from ‘penggulung,’ the Malay word for roller, which is the action a pangolin takes in self-defense. When threatened, a pangolin rolls itself up, tucking away its head and softer underbody. The scaly armor on the outside is impenetrable even by large carnivores of the forest. But human hunters can simply pick up these animals and that is what has been happening. Their scales have a huge demand in native Chinese medicine and are believed to cure a huge range of problems – from cancer to palsy. The captured pangolins are also valuable for their meat which is considered a delicacy across South-East Asia. While many organizations are trying to save them, the only way to deter poachers is for us to become informed citizens and refuse medicines or meat that come from these helpless animals.